Syria’s former al-Qaeda affiliate and a set of hardline allies have taken over the country’s rebel-held northwest, the last bastion of determined opposition to the regime of Bashar al-Assad. They’re apparently convinced they can reverse the rebellion’s downward trajectory and kneecap “defeatists” within the opposition who might settle for anything less than toppling the regime. And they think they can rebalance the opposition’s lopsided relationships with its foreign backers, forcing countries like Turkey and the United States to engage them on their terms. They’re wrong. And by hijacking Syria’s armed opposition and placing its core under unambiguous jihadist control, they’ve likely sealed its fate. In January, the Fateh al-Sham Front—formerly known as the Nusra Front, Syria’s al-Qaeda affiliate—broke Syria’s northern factions. While most of Syria’s rebel brigades were negotiating with the Assad regime in the Kazakh capital of Astana, Fateh al-Sham rolled through the northwest, forcing the Astana factions’ local subunits to yield and surrender their weapons stocks. It also seized effective control of the northwest’s main supply lines. Days later, Fateh al-Sham and others announced Hayat Tahrir al-Sham, or the Body to Liberate the Levant. It brought together the rebel north’s malcontents: opposition elements that had been designated terrorists and droned, that had been made pariahs, or that were just offended by the opposition’s increasingly pragmatic, realist bent. Fateh al-Sham Front merged with rogue Aleppo faction Harakat Nour al-Din al-Zinki, several smaller rebel units, and whatever pieces they could pry off of major opposition faction and Islamist movement Ahrar al-Sham. Now Hayat Tahrir al-Sham (or simply Tahrir al-Sham) runs the rebel northwest, centered on Idlib province, and day by day it assimilates more of the remaining armed opposition. Syria’s former al-Qaeda branch had previously worked to camouflage itself with the rest of the rebellion. With the announcement of Tahrir al-Sham, it took outright control. Tahrir al-Sham, the new super-faction, is officially led by Hashem “Abu Jaber” al-Sheikh, former leader of Ahrar al-Sham. 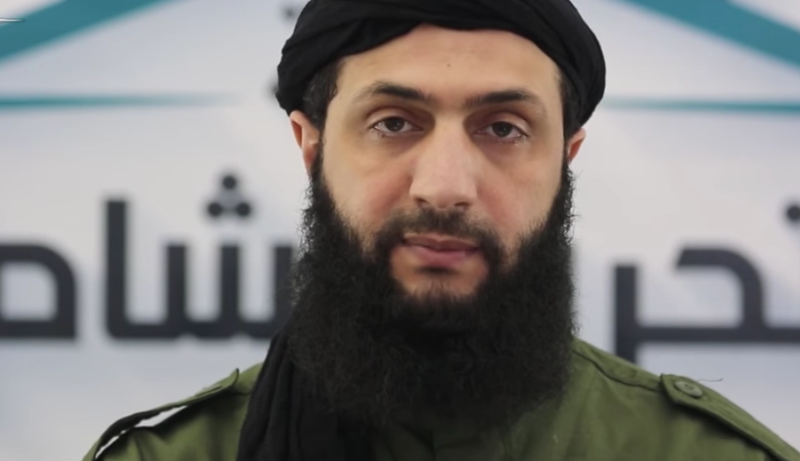 But Fateh al-Sham’s leader, Abu Muhammad al-Jolani, is the new group’s overall military commander and is widely seen to be the power behind the throne. Hayat Tahrir al-Sham military commander Abu Muhammad al-Jolani tells rebel participants in negotiations to “step aside.” Source: YouTube. There’s both a political and military logic to Tahrir al-Sham. The military rationale is relatively self-evident, premised on integrating the opposition’s most effective fighting forces. Arms supplies may be cut to northern rebels, but, the thinking goes, Tahrir al-Sham can sustain itself on war spoils and its existing stockpiles. It can also rely more heavily on behind-the-lines, insurgent-style attacks, as in a February 25 suicide raid on the regime’s security services. The political idea behind Tahrir al-Sham is riskier, however, and more provocative. After all, Tahrir al-Sham’s founding principles include not just “rejecting the political process leading to surrender and the reproduction of this criminal regime,” but also “establishing balanced relations with influential parties”—that is, foreign states. Tahrir al-Sham isn’t rejecting international diplomacy and negotiations per se. Rather, it’s attempting to reset the increasingly unfavorable terms of Syria diplomacy and shake up the opposition’s relationships with countries such as Turkey, which have been able to manipulate a fragmented, dependent Syrian opposition. Tahrir al-Sham religious official Abdurrahim “Abu Abdullah al-Shami” Attoun (formerly of Fateh al-Sham) elaborated further in a purported open letter published online. He wrote that Tahrir al-Sham aims at establishing relations with foreign governments “without subordination to those states, such that we don’t provoke their hostility and we don’t appeal for their help.” He made clear that Tahrir al-Sham objected specifically to Astana and proxy enterprises like Turkey’s “Operation Euphrates Shield,” in which it has enlisted Syrian rebels to fight alongside the Turkish military against the Islamic State and Kurdish forces. Dallati is a veteran of Syria’s Islamist movement and, as a civilian independent, a sort of influencer among Syria’s armed factions. He spoke to me over WhatsApp from inside Syria, where he said he had met with Tahrir al-Sham’s leadership. I was told by multiple sources outside Tahrir al-Sham—but in communication with its membership and familiar with its thinking—that the group’s leaders are convinced they can compel internationals to engage it by establishing the group as their only truly credible rebel interlocutor. Tahrir al-Sham, by this logic, would be something akin to the Taliban—foreign powers might spurn it initially, but eventually they’d acknowledge they had to talk. Tahrir al-Sham, by this logic, would be something akin to the Taliban—foreign powers might spurn it initially, but eventually they’d acknowledge they had to talk. Former al-Qaeda affiliate Fateh al-Sham has, under various names, been a U.S.-designated foreign terrorist organization since 2012. Zinki’s own misbehavior and erratic conduct alienated Turkey and Western backers in 2015. Now they want to be at the head of the opposition, and in its place at the negotiating table. Tahrir al-Sham has adopted more recognizably mainstream revolutionary rhetoric in its latest statements, positioning itself as the vanguard of the broader Syrian opposition, even if it hasn’t moderated its commitment to establishing sectarian Islamist rule in Syria. It is also establishing a political-media office, including a foreign relations section, along the lines of other rebel factions’ representative political offices. But, multiple knowledgeable sources told me, Turkey has refused to allow Tahrir al-Sham to open an office inside Turkey. Zinki previously had representation in Turkey, but Fateh al-Sham did not. A spokesman for the Turkish government did not respond to requests for comment before publication. I also corresponded with several Tahrir al-Sham officials, but they didn’t respond to a set of questions I sent them before publication. In that respect, Tahrir al-Sham’s founders seem to have miscalculated. The U.S. government has yet to explicitly clarify its position on Tahrir al-Sham, but the formal designation of Tahrir al-Sham, or the extension of Fateh al-Sham’s designation to include Tahrir al-Sham, seems to be coming. “We’re still looking at the extent of the merger and how Hayat Tahrir al-Sham (HTS) really functions,” said a U.S. official involved in Syria policy, “but preliminarily, this looks like an al-Qaeda play to bring as much of the Syrian opposition under its operational control as possible, thereby making groups that merge with HTS part of al-Qaeda’s Syria network. In that sense, it is not unlike the formation of the Mujahideen Shura Council in Iraq in 2006, which eventually brought the better part of the Iraqi Sunni resistance under al-Qaeda’s control and morphed into the Islamic State of Iraq that same year. “We are still studying the issue carefully,” the official continued. “But at this point we would caution any group from joining HTS because they risk becoming part of an organization we are determined to destroy because of the threat al-Qa’ida poses to us, to the region, and to other Muslims. The mark of Cain on the Nusra Front—or the Fateh al-Sham Front or Hayat Tahrir al-Sham, or whatever new mix-and-match name it adopts—is indelible. Foreign states are determined to crush it, either through direct action or by aiming local proxies against it. And not every rebel wants to run up the black flag. Tahrir al-Sham has little apparent compunction about asserting its dominance and making clear it plans to assimilate the entirety of the northern rebellion. But many rebels who don’t want to be press ganged into a jihadist army seem likely to move to Euphrates Shield or abandon the battlefield entirely. Tahrir al-Sham will increasingly have to shoulder a military burden it can’t bear, not alone, and not if Idlib becomes too radioactive for international support. Foreign military support to rebels in the northwest has reportedly been cut since Fateh al-Sham’s January show of force, although that may be temporary. What will happen to the cross-border humanitarian and stabilization assistance that sustains the area’s civilians is unclear. Hayat Tahrir al-Sham’s founders thought they could change the rules of international diplomacy on Syria and halt the opposition’s slide toward sub-revolutionary compromise, or just survival. But they couldn’t. Instead, they’ve launched themselves—and the Syrian opposition along with them—on one last kamikaze charge. Cover: Hayat Tahrir al-Sham head Hashem “Abu Jaber” al-Sheikh delivers inaugural video address, YouTube.